Anyway, today is Halloween. 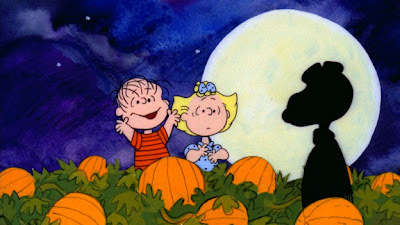 I hope you are enjoying some good ole Charlie Brown and his great pumpkin. Marty found this article about Halloween that has made us think about how we view this day. "Jesus said there are two commands that matter: love God and love your neighbour. The Easter holiday is all about the first command. Halloween is all about the second. What other day of the year can you put on funny clothes and be welcomed at your neighbour’s house? In my neighbourhood Halloween is the only day of the year that that people actually get out of their houses and chat with the neighbours that they don’t know. It is a night of celebrating community." Click Here to read the whole article- Just some thoughts to mull over while you are enjoying yummy chocolates tonight. Our friend won the opportunity to buy tickets to a playoff game against the Phillies this past week while they were playing in St Louis. He invited Marty to go on Tuesday night, which was the night they lost to the Phillies, yet Marty had a great time and even brought home a rally towel :). Last night we went to a local pizza place to watch the Phillies-Cards face-off and cheered with the rest of St Louis to the Cardinals victory. To say the least, we have jumped on the Cardinals bandwagon and are excited to cheer them on however far they make it :) The past two Fridays, we have had Cardinals days- which means teachers and students can wear jeans and Cardinals attire. 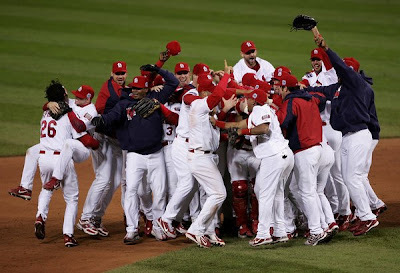 This alone makes me a Cardinals fan as we never ever have jean Fridays :) This whole city is so excited, and it has been so fun to be a part of it here with them!